The Jeolwol Daeboreum festivities date back hundreds of years and it is still amazing to see just how many people come out to these celebrations. This festival is held on the first full moon of the lunar year. The typical celebrations will start in the afternoon with singing and dancing until the final main event. Here in Ulsan, the main event is the burning of the Daljib. The Daljib is the large pile of straw and branches that gets burned to ward off evil spirits and misfortune in the new year. As it is Lunar New Year our school was closed and we got not one but TWO extra days off. So it was a four day weekend whoop whoop! Myself, David, Amanda and Brandon decided to spend it exploring Busan. We are all trying to be healthy at the moment so we decided to go for a hike and try and be healthy the entire weekend. We left our village, Gyeseong on Friday evening and took the bus from Changnyeong to Busan. We headed straight to Nampodong as we were staying in a hostel here. 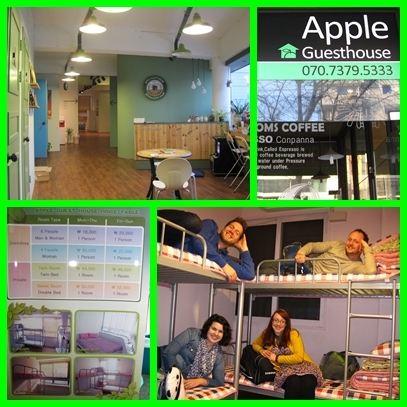 We decided to stay in Apple Guest House for two nights as it was in a good location and was great value for money. Well Sol-lal is finished and for those who don’t know what that is, it is when Korea celebrates the Lunar New Year. Being as this is a blog about photography in Korea, I though that I would take this time to look back at the previous year. 2011 was a great year and so far 2012 is shaping up to be even better. I actually learned a great deal in 2011, thus I want to share it with you. First of all I just want to give a shout out to the people that have inspired me and helped me out of the last year. These selection people have made a great impression on me over the past year and I just wanted say thanks. It’s 12:25 a.m. on Sunday, the eve before Korea’s Lunar New Year, temperature for tomorrow predicted at -1. I’ve been typing away on a couple marketing projects all day, while Joe fried beans for seven-layer dip, trucked to Home Plus for a bottle of wine, some Johnnie Walker Red, a pineapple, other colourful things. Now he is chopping mushrooms for pasta salad, preparing for our overnight trip tomorrow with friends to a pension in Yangsan. The train will leave from Bujeon Station at 10:30 a.m. I haven’t packed but the Philippines is fading and between preparing to leave Korea (38 days! ), selling my bookcase, my couch, my mirrors, teaching, writing text for websites and reading up on Rajasthan (11 hours, the guide book says, from Delhi to Ajmer, then 30 minutes to Pushkar…) the blog has been on an unwanted pause. Gonna be around Busan through the Lunar New Year Holiday?? Have no fear, the Blue Monkey in KSU will be partying it up the whole way through!! EVERY NIGHT from Friday to Monday we'll have the DJ ROCKIN the place out with your favorite tunes!! We'll also be having DRINK SPECIALS going and a special GAME for everyone to play and have a chance to win shots/pitchers throughout the holiday!! Add us on facebook and be the first to know about specials and events going on! !